It is replaced by the Symbol PPT 8800. The PPT 2842 Series, a member of the newest family of Pocket PC-based terminals, combines the strengths of the Pocket PC platform with productivity-enhancing features that include barcode scanning and real-time wireless communication options. Designed with today's mobile worker in mind, the rugged PPT 2842 Series is a productivity tool for business professionals, enabling the Power of Pocket PC to perform where and when it's needed. The Pocket PC platform offers a simple, fast user interface, extensive Internet browsing capabilities, and powerful overall performance, and the PPT 2842 Series transforms business activities, extending this familiar Windows-based platform from the traditional desktop setting to virtually anywhere. 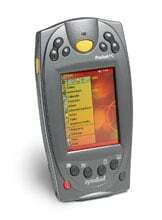 Symbol's rigorous quality requirements impart drop, sealing and temperature specifications that are unmatched by other Pocket PC devices. The rugged durability achieved allows the PPT 2842 to withstand the wear and tear of everyday use in any business environment, from the office to the warehouse. All units ship with one product reference guide. 64 MB RAM, 802.11, monochrome display. Includes 1D scanner & battery. Order cradle separately. See accessories. 64 MB RAM, 802.11, color display. Includes 1D scanner & battery. Order cradle separately. See accessories. Replacement battery for the Symbol/Motorola 2846/47 BACKUP. Original part number. 3 volts 20 mAh.